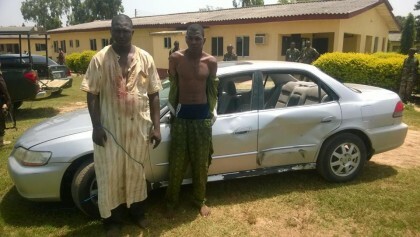 Sani Kukasheka Usman, Abuja: On Wednesday 5th October 2016, troops of 1 Division Nigerian Army stationed in Anchau, Kubau Local Government Area of kaduna State, arrested 2 kidnappers in the process of collecting ransom from a kidnap victim’s family in the area. The troops recovered Honda Accord car, one mobile telephone handset, 4 MTN, 1 Airtel Subscribers identified module (SIM) cards, 1 micro SD card, a national identity card, an INEC voters registration card, a Miyetti Allah cattle Breeders’ Association of Nigeria Identity Card, United Bank for Africa and Keystone Bank Debit Cards, cash sum of Twelve Thousand, Seven Hundred and Ten Naira (N12,710.00k) and a Notebook containing several names, addresses and telephone numbers of kidnap victims families and relations. The suspects are currently being investigated. Recall minister in the immediate past administration was abducted with her husband on Monday, but yesterday the former minister who was kidnapped along with her husband regained freedom from the hands of kidnappers in Kaduna.